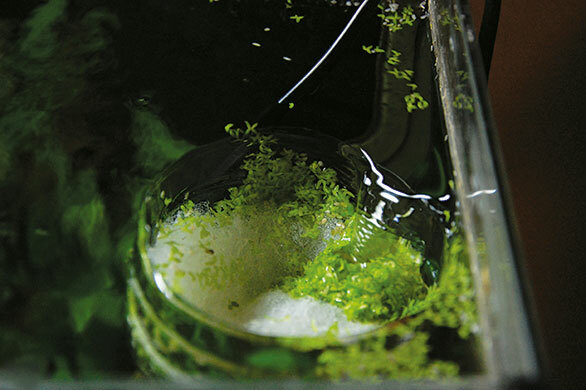 Common Duckweed, Lemna minor, can be nature’s best friend at times, for example when it is used in bioremediation efforts to purify contaminated water. It grows explosively, each floating plantlet budding off two daughters in frenzied reproduction, and it can be used to remove pollutants such as nitrate, phosphate, and even spilled toxins from waterways and reservoirs. It can also be an invasive nuisance, smothering an aquarium or pond, choking off light to plants below and making maintenance sessions messy and unsatisfying. Any stray bit of duckweed missed in a cleaning session often seems able to rebound and quickly cover the surface of the tank. I have had the problem of duckweed overgrowing the surfaces of my tanks for years, and skimming with a net is quite cumbersome. The only benefit I saw from having these prolific little pads growing in my systems was that any bound nutrients were removed from the aquariums when the masses of duckweed were removed. Nevertheless, it’s a lot of work that takes time and feels like a losing battle, so I started thinking about how to accomplish the task more easily. When I looked at my internal power filter, it occurred to me to turn the whole thing upside down. This led me to design a Do-It-Yourself Duckweed Collector. 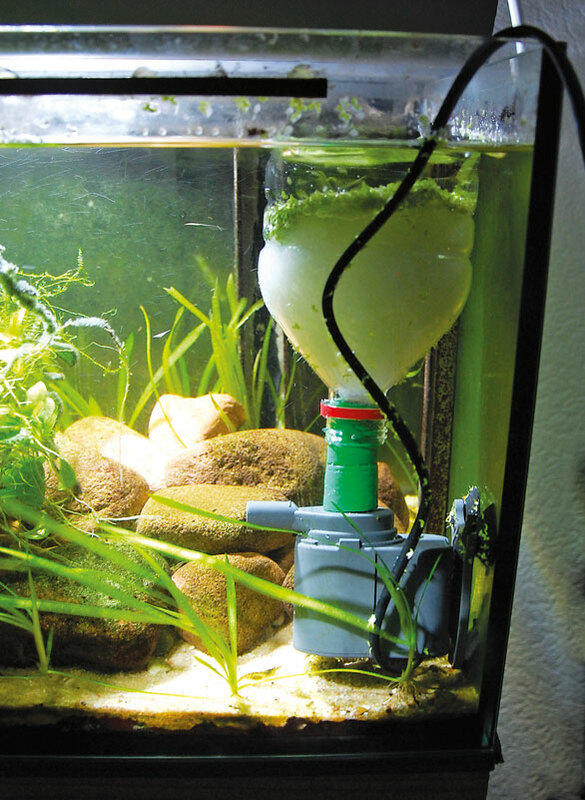 DIY duckweed skimmer quickly clears floating duckweed from the aquarium surface and traps it in a mat of filter floss. I stuffed a little filter floss into the cut bottle, mounted the contraption in an aquarium that contained duckweed, and plugged it in. After I determined the optimal height at which to mount the collector to skim the water surface, it worked fine. Since I had chosen a rather strong pump, the free-floating duckweed was pulled into the floss within a few minutes. To avoid having the duckweed go back into the aquarium when you go to empty your harvest of duckweed, you must pull the collector above the water’s surface before you switch the pump off. I must admit that my design is not a beauty, and certainly cannot be used unobtrusively in your living room aquarium. However, for temporarily removing most of the duckweed from a tank, this collector is a fast and affordable option. Not a thing of engineering beauty, but the author’s duckweed skimmer works and is only used during maintenance sessions. 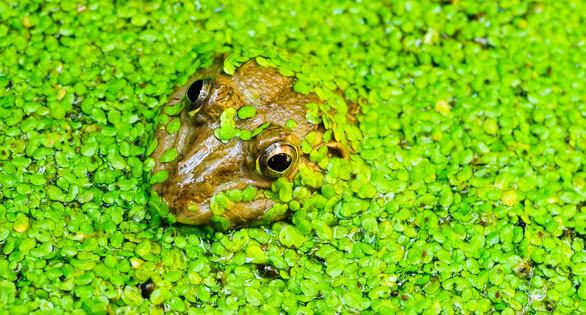 • Duckweed is an important high-protein food source for waterfowl and also is eaten by humans in some parts of Southeast Asia. As it contains more protein than soybeans, it is sometimes cited as a significant potential food source. The tiny plants provide cover for fry of many aquatic species. The plants are used as shelter by pond water species such as bullfrogs and bluegills. They also provide shade and, although frequently confused with them, can reduce certain light-generated growths of photoautotrophic algae. • The plants can provide nitrate removal, if cropped, and the duckweeds are important in the process of bioremediation because they grow rapidly, absorbing excess mineral nutrients, particularly nitrogen and phosphates. For these reasons they are touted as water purifiers of untapped value.